Can’t keep your Iliad and your Odyssey straight? Is Faulkner’s dense, lengthy prose making your eyes cross? The SparkNotes iPhone app brings comprehensive, downloadable details and information to help you study literature and philosophy more effectively. As a bonus, SparkNotes incorporates sharing to Facebook and Twitter. You can share your location and what you’re reading, so you can connect and study with others. 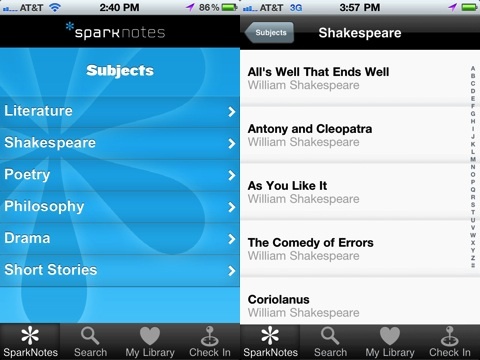 SparkNotes iPhone app is simple and attractive to use. A smart navigation bar at the bottom of the screen lets you search, check-in, and access your collection of SparkNotes with one touch. You can explore the pre-loaded content from the home screen, or you can download new ones to your device by using the search icon. As long as you have downloaded a book or play’s content to your iPhone app, it is available for off-line use. For each book, play, short story, or poem, the SparkNotes iOS app’s content is neatly and concisely presented for easy navigation. The top menu bar lets you add it to your favorites and share, as well as download for offline use with a touch. Typically, there is a table of contents section where you can learn more about the context, plot overview, and character list. Each chapter or logically created section for plays and poems contains a summary and analysis. You use agile, precise gesture controls to scroll through well-crafted content. Since I have a Bachelor of Arts in English and, as a result, have read many of the books listed, I was impressed with the amount of information and accuracy. Current students will certainly find more success using SparkNotes to complement their reading of the book and in-class discussion. As a parent, it is certainly a tool to help you stay on top of your children’s required reading, papers, and projects as well. The SparkNotes iOS app is a super skinny edition of its online version, but its focus on delivering quality study guides with excellent interface has paid off with a successful user experience. AppSafari review of SparkNotes was written by Jenni Ward on July 3rd, 2012 and categorized under App Store, Education, Free. Page viewed 5423 times, 2 so far today. Need help on using these apps? Please read the Help Page.